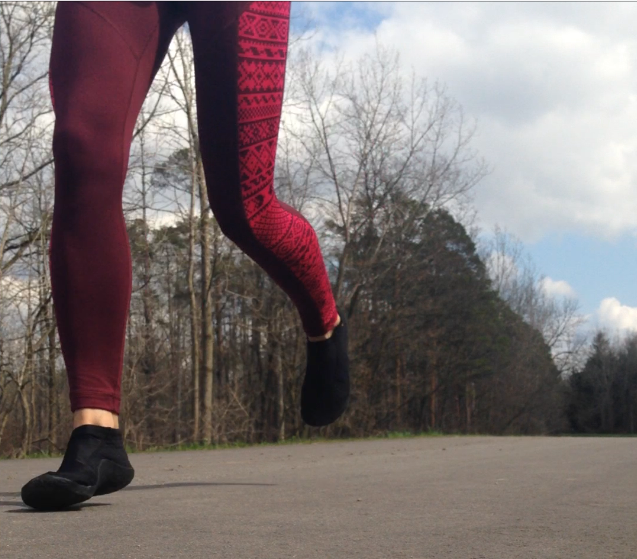 For most heel strike runners, running is painful on the leg, especially the knees and the lower leg. But, sorry to disappoint heel strike runners further, but sural nerve pain may be another problem to worry about, among the other injuries related to this style of running. The sural nerve (shown below) runs down the back of the lower leg and becomes entrapped when posterior lower leg compartment pressures become too high, particularly during heel strike running because compressive impact forces are high. Anatomical drawing depicting the location of sural nerve. Source: Fabre et al. 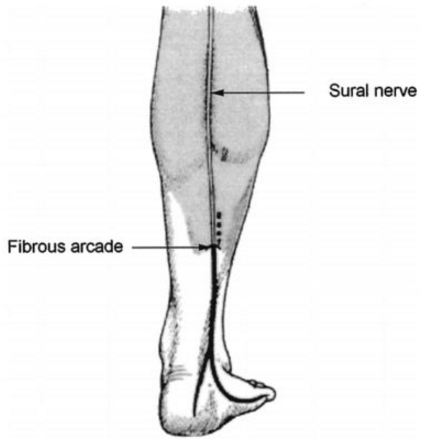 Chronic calf pain in athletes due to sural nerve entrapment (Fig 2). Amer J Sports Med, 2000, 28(5):679-682. The main symptom of sural nerve pain when running is chronic calf soreness which radiates to the foot because of pressure-induced entrapment of the sural nerve. This results in lower leg exertional compartment syndrome, a condition that is more common in heel strike runners than in forefoot runners. Running with a heel strike exposes the lower leg to greater vertical force impact peaks, instantaneous loading rates, higher ground reaction forces, and higher peak tibial axial and shank accelerations compared to forefoot running. These heel strike-related forces take a toll on the legs simply because the lower leg did not evolve the capacity to dampen the braking forces of the moving trunk at heel strike during running. Think about it, if humans evolved a safe braking-system for running, heel strike runners would never encounter injuries, but statistically, they sustain more injuries than forefoot runners, and sural nerve pain can now be added to the long list of injuries related to heel strike running. Above, shows a forefoot strike landing where the foot and ankle position is near the knee at touchdown, which reduces braking and posterior compartment pressures of the lower leg. Above, shows a heel strike landing and how the foot and ankle is positioned ahead of the knee at touchdown, causing a high braking force which increases lower leg muscle compartment pressure and induces swelling and nerve entrapment. 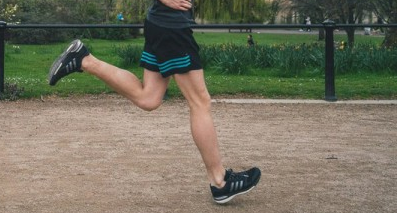 One common approach to treat sural nerve pain is to run with a forefoot strike because the mechanics of this style of running encourages favorable torso and foot positions that reduce compressive pressure off the lower leg, so there is less chance of nerve entrapment in the lower leg because the surrounding tissues aren’t swelling because impact is very minimal. A study by Lieberman et al. reported that forefoot running reduced impact loads by reducing the effective mass on the lower leg, which caused the leg to have a less hostile response to touchdown as compared with heel strike running. 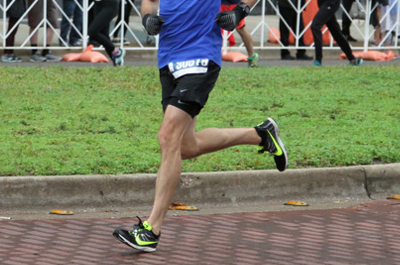 How does forefoot running do this? In forefoot running, ankle plantarflexion at touchdown helps reduce impact loading, meanwhile the knee flexes (i.e. softly bends) which helps absorb impact. Allowing the body to slightly fall forward during forefoot running increases knee flexion as well. Collectively, there is a smoother transfer of body weight over the foot and lower leg in forefoot running which is consistently supported by empirical evidence that explains how forefoot running eliminates chronic exertional compartment syndrome in heel strike runners. In running, most sural nerve entrapment injuries are pressure-induced and reducing compartment pressures is the most basic method to prevent pressures from engulfing the sural nerve. Forefoot running plucks out impact-related variables involved in exertional compartment syndrome by allowing favorable body positions that undercuts loading on the leg. Barefoot Running – Running barefoot daily keeps your forefoot running form strong, especially for when you run in shoes. Forefoot Running – Improve your running performance and protect yourself from injury. 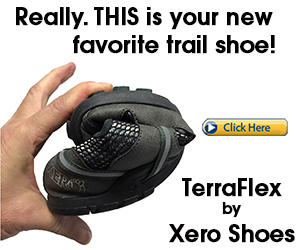 Minimalist Running Shoes – If you don’t want to run barefoot, you can run in running shoes that feel like you are almost barefoot! 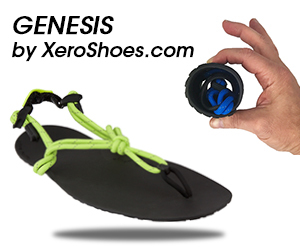 Xero Shoes – Great for summer running, and are easily customizable to fit comfortably to your unique foot structure. Derrick TR. The effects of knee contact angle on impact forces and accelerations. Med Sci Sports Exerc. 2004;36(5):832–7. Fabre et al. Chronic calf pain in athletes due to sural nerve entrapment. 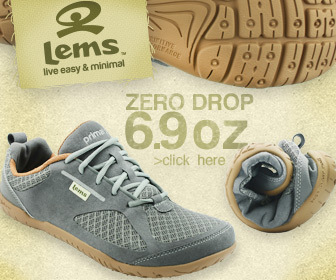 Amer J Sports Med, 2000, 28(5):679-682. Lieberman DE, Venkadesan M, Werbel WA, et al. Foot strike patterns and collision forces in habitually barefoot versus shod runners. Nature. 2010;463(7280):531–5.